Please join us at JAUS for the closing reception of "Head Space" a two person exhibition featuring new sculptures by Tanya Batura, and new paintings and drawings by Brian Cooper. Batura and Cooper were paired to exhibit together for multiple reasons. Upon first observation, one immediately notices that both demonstrate a high degree of craft, with a majority of their recent works adhering to a restrained, relatively monochromatic palette. In contrast to the somberness of their color schemes, the works present a subtle and wry humor of sensual forms that playfully allude to their inner thoughts and ruminations. On a more conceptual level, the two artists diverge in that Cooper, with his most recent series “Empty Space Is Not Nothing”, draws inspiration from nature and science documentaries that describe space as a physical and malleable substance. Reminiscent of his earlier sculptures, he connects to more familiar objects like fleshy bodies, lumps of clay or upholstered cushions. 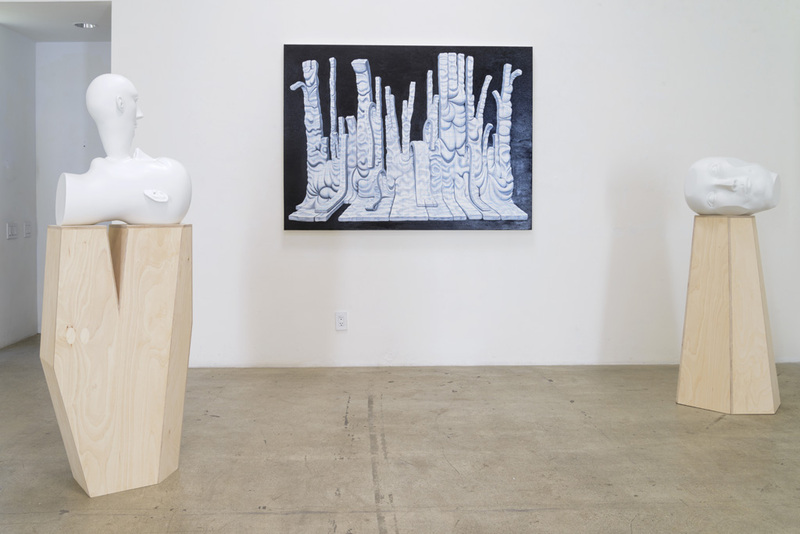 Batura, on the other hand, views her giant ceramic heads as incorporeal objects that explore themes of death and the physicality of the human body. With her more recent sculptures, she finds inspiration from her childhood fascination with books and images relating to séances and the occult. She is focused on giving substance to the ectoplasmic manifestations that frightened her as a child. In spite of these differences, what unites the recent work of Batura and Cooper most compellingly, is the fact that they strive to reach for and make sense of what most people would consider the “unknown”. They long to give thoroughly detailed form to imagined realms that lie beneath, behind or beyond our immediate surroundings. In this sense, there is perhaps a nod to Surrealism. Yet unlike their manifesto waving predecessors, the quirky, almost self-deprecating tone gives both of their work a fresh, sympathetic quality allowing for multiple readings that lie somewhere in the nether regions of childlike awe and self-conscious wit.